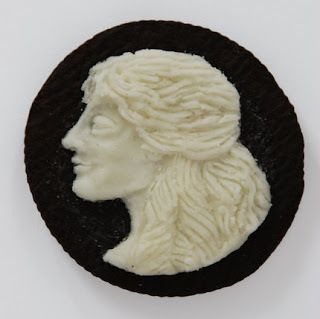 But while we see the classic black-and-white cookie and rush to the fridge for a glass of milk, innovative artist Judith G. Klausner sees potential for ingenius sculpture. 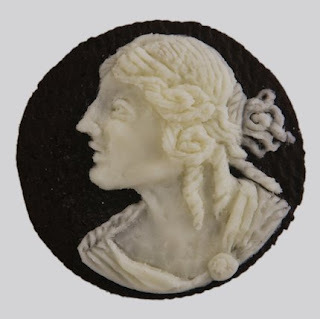 Klausner painstakingly sculpted heirloom-worthy cameo portraits out of the white, creamy filling of the sandwich cookie, leaving gorgeously-detailed, alabaster silhouettes of Romanesque beauties contrasting against the black of the chocolate wafer. 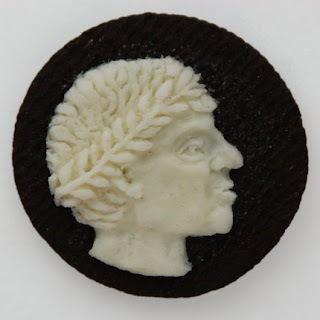 The Oreo Cameos are just the latest example of food artistry in Klausner's portfolio. She has previously embroidered toast to create a trompe-l'oeil mold effect and stitched sweet samplers out of thatched Chex cereal. Her work manages to strike that careful balance between playful, brilliant, and delicious. We can't help wondering, though - are those canvases Original, or Double Stuf? It makes me want to go out an get a bag of oreo cookies. Very clever art work and article.